She sat in the corner booth, minding her own business, eating her pie and reading her novel. Customers were greeted with the HELP WANTED sign on the wooden door as they entered the diner, an icon of the little town. The room was packed full of men, women and children waiting on the solo waitress to multi-task as she took orders at the counter, stared at dirty tables, taking time-outs to deliver food. Customers were tapping their feet and grumbling under their breath as patience grew thinner by the minute. That’s when she looked around, put the bookmark in its page, rested her fork next to the half-eaten pie, got up and silently start working. She began removing dirty dishes from each table to the empty cart next to the counter, stacking plates, glasses and silverware one by one. 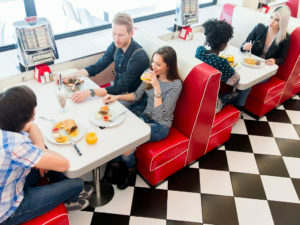 She took the dishcloth from the soapy water and wiped down each table, marrying the salt shaker to the pepper and placing the menu in the upright position between the ketchup and the mustard. She moved effortlessly from one table to the next while customers watched silently. She returned the dishcloth to its home and walked back to her corner table, opened her book and continued eating her pie as if nothing had happened. Slowly customers began taking seats at the newly clean tables as a sense of peace and calm fell over the little diner. The shoulders of the waitress dropped as if a weight had physically been lifted. People started laughing and chatting with strangers. Time did not seem to be important anymore. No applause. No money. Just one simple act. We really can make a difference…one act of kindness at a time. This entry was posted in devotional, inspirational, motivational, spiritual on November 13, 2018 by Deanna Young. It was a wonderful thing to do. When we see someone struggling and need help, we should take time to pitch in. This makes life better. A small, big thing! And it all matters.